Italy, the birthplace of western culture. A famous country in the Southern Europe because of her delicious Italian cuisines, fabulous fashion trends, diverse cultures and beautiful coasts. And we should not forget the popular mountain ranges such as the Alps and Apennines where travellers love to check on! Who would not want to visit this gorgeous place? Well, your dream might come true! Because AutoEurope is now hosting a raffle draw where ONE lucky participant will get to experience the beauty of Italia! 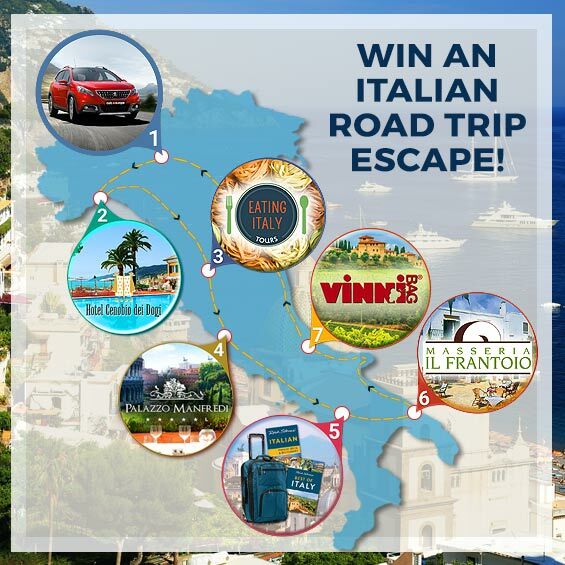 The giveaway winner will get a chance to experience a 7 night road trip in Italy. Visiting various places and of course, lodging to reputable hotels such as the Hotel Cenobio dei Dogi, Palazzo Manfredi, and Masseria il Frantoio. The winner will also get a $250 worth of car rental from AutoEurope while bringing a travel package from Rick Steves. And of course lets not forget the travel bag from VinniBags. Such glory awaits you! So what are you waiting for? The contest will end at 11:59pm on Sat, Aug 6th, 2016, just a few days ahead. An awesome hotel that sits near the Camogli San Fruttuoso train. Travelers can reach the hotel after a 7-10 minutes walk tour from the said train station. It is also around 15km away from Galleria d’Arte Moderna. The hotel offers a wide variety of delicious foods and cuisine. They also have a bar that offers a regular live music. The hotel has a beautiful access to a private beach, spas and other body treatments. Such treatments will entirely liven up your travel in Italy! The hotel also serve a free WiFi access, flat screen TV’s and marble baths! This 6-minute walk from the Colosseum hotel obviously has the most stunning of all, the Colosseum views! A five-star hotel that boasts her 17th century, multi story villa that sits right up next to the gladiator arena, Ludus Magnus, The Great Gladiatorial Training School. Who would drool from this awesome location? Masseria il Frantoio is a 4.5 star hotel set in 16th and 19th-century farm buildings. It sleeps 9 km away from the beach of Camping Villaggio Il Pilone. This last hotel will surely refresh your travel with a beach near the hotel. She also serve a free breakfast free WiFi and awesome garden views. The hotel boasts its medieval-style restaurant, a bar and a lounge. Surely an awesome stay to relax at the end of your trips. AutoEurope is offering a $250 car road trip that can be used in 12 months. This awesome offer will surely bring to you the #BestItalianRoadTrip. You can view here about their offers from Italy, to Europe, to the Americans and up to the Asian continent. There are numerous travel destinations in Italy. You can check some of AutoEurope’s Italian travel guide and make your own dream itinerary now! Set your eyes at the beauty of Almafi Coast and the green Lazio Sabina. Feel the coldness of Stelvio Pass and watch the sunset at Tuscany. Do not forget to swim at Lake Garda and Enjoy the view at Sicily. All of these can be found at AutoEurope’s travel guide. last but not the least is to learn the cultures and language of Italy. They have a diverse culture and an awesome language that most foreigners are having a hard time. With this guide, you can learn Italian in easy steps!